August 9th, 2013 | Around The U.S.. The city of Denver is widely known for its breathtaking beauty with clear views of the Rocky Mountains from its downtown skyline. Many people who move to Denver do so because of the plethora of outdoor activities that the city and surrounding area offer, including hiking, climbing, swimming, skiing and snowboarding… just to name a few. Bekins is out to explore some of the best attractions, venues and restaurants that Denver offers. We’ll also highlight two Denver moving companies who have the ability to get you to Denver faster than you can say Mile High City! Red Rocks Amphitheatre: Red Rocks is one of the most widely known concert venues in the U.S., but did you know this venue houses way more than just a stage? The whole complex boasts hiking and biking trails as well as yoga, movies, and of course, world-class concerts. 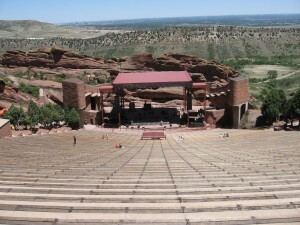 Voted by Rolling Stone Magazine as the Best US Amphitheatre, this is one attraction you won’t want to miss. Winter Park Resort: If you’re visiting Denver in the winter months and wanting to do some serious skiing, then look no further than Winter Park Resort. There are over 3,000 acres of skiable land good for any skill level and other activities such as snow tubing for those who aren’t quite as adventurous. With great deals on lodging all year round, you can combine your accommodations with your entertainment. Root Down: A local Denver favorite, Root Down prides itself on serving as much organic and locally produced food as possible. Fans of the restaurant have embraced their attitude and suggest that you either order the Sweet Potato Fries with Curry-Lime Yogurt or make it in time for brunch. Vesta Dipping Grill: If you’re a fan of dipping sauces, then you can’t miss Vesta Dipping Grill. With over 20 choices to choose from, each meal is accompanied by three of the dipping sauces. If desserts are more your calling, then you must try the sticky toffee pudding. Guess what! Even the desserts come with dipping sauces too! Lola Denver: If Mexican food is your true calling, then a dinner at Lola’s needs to be in the books. Fans of the restaurant rave about the guacamole, but they also boast a ceviche bar, and a wide variety of favorites such has enchiladas, carnitas and carne asada. This blog post could go on for days if we mentioned every attraction, restaurant and venue that Denver has, but hopefully this has given you a taste of what the city can offer. And as you can see, it offers a lot. If you’re contemplating a move to the Mile High City, look no further than these two Denver moving companies that fall under the Bekins umbrella of agents. Denver Moving Company: American Moving in Broomfield, Co.
Denver Moving Company: Daniels Moving & Storage, Inc. in Colorado Springs, Co. Follow along with Bekins as we continue our trek across America. Have you read our other blog posts? We’ve visited San Diego, Orlando, Cleveland, and Washington D.C.